If you’re looking for some help on choosing where to sit at Spa-Francorchamps, then you’ve come to the right place! We’ve created the guide below to be as helpful as possible in advising you to pick a place to watch the next Belgian Grand Prix from. We’ve taken into account the best place for overtaking, likely place for spins and crashes, the best atmosphere and proximity to the facilities. It’s all covered and we’ve ranked it in order of our personal opinion. We’ve being recommending the following ticket resellers to our visitors for over 10 years now. They all provide secure online payments, multi currency and a choice of general admission, grandstand seating and hospitality packages. Always a popular place to watch the race from, the grandstands near the start/finish straight are always the first to sell out. With good views of the pre-race build up, the start of the race and of course the cars passing the chequered flag and crossing the finish line, there is plenty of excitement experienced here. You will also have great views of the F1 team garages and their pit activities. The podium celebrations take place near the pit lane entrance (Gold 1), so it really is one of the best places to be a spectator. Gold 1, 8 and 9 all have views of the start/finish straight. From Gold 1 you will have the best view of the pit lane, since this grandstand is located halfway down the pit straight directly opposite the pit boxes. Gold 9 has an excellent location since it is also perfectly placed to see the cars tackle La Source which is the tight first turn. The ‘Chicane’ is the final corner of the circuit and follows on from the sweeping left hander of Blanchimont. Some F1 fans still call it the Bus-Stop chicane, as it use to be known for many years. The cars will need to brake very hard for this tight right-left chicane, after they have taken Blanchimont at such high speeds. The cars will be taking this chicane very slowly, at speeds of around 90km/h in 1st gear. The Chicane is right before the finishing straight and acts as a great overtaking opportunity. Gold 6 has a fantastic view of the Chicane, as well as good views of Blanchimont and the entrance to the pit lane. There is also a big TV screen visible from this grandstand, so spectators can follow the rest of the race action. The La Source hairpin is the first corner after the start/finish straight. Cars slow right down to around 64km/h for this this tight right-hander and it is usually taken in 1st gear. The pit lane exit is just after the La Source hairpin, so watching the race from this part of the track you will be able to see the start/finish action as well as some exciting pit lane exits. 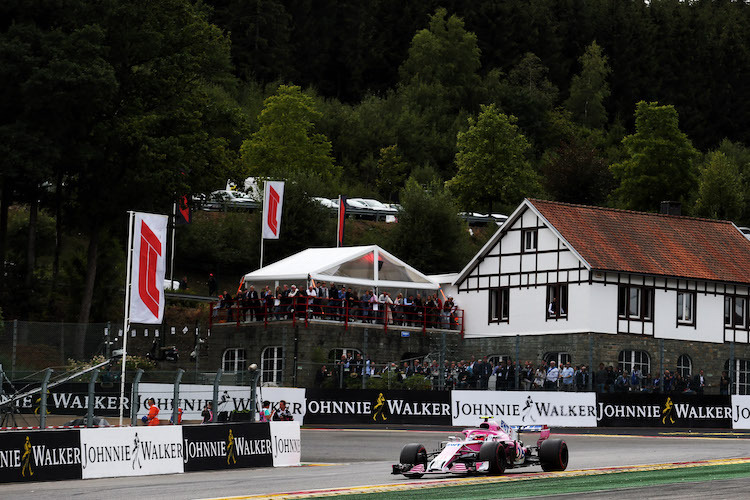 La Source is also one of the best overtaking opportunities at Spa-Francorchamps! Gold 8 has the best view of La Source. You can see the cars brake and turn into La Source from Gold 9, which also has excellent views of the start/finish line (Gold 8 has distant views of the chequered flag). Gold 7 has a view of the exit of La Source and the pit lane exit too. There are big TV screens visible from all of these grandstands, so spectators can follow the rest of the race action. Eau Rouge is a notoriously challenging S-turn following a long full-throttle straight after turn 1. A critical point of the circuit, as much leverage as possible needs to be gathered at this uphill turn to tackle the following straight at a good speed. The cars will be doing around 290km/h here in 6th gear. Not only is this an exciting corner for the spectators, but also the drivers who experience the thrilling challenge of taking the Eau Rouge complex flat out. Gold 3 and 4 have great views of this S-complex as well as the exit from the La Source hairpin and all the way through to the Raidillon corner. There is also a big TV screen located at Eau Rouge, visible from these grandstands, so spectators won‘t miss out on the rest of the race action.Eau Rouge is a fan and driver favourite. If don’t choose to watch the race from here, be sure to walk and check it out on the Friday or Saturday of the GP weekend. Turn 17 of the circuit is the very fast, sweeping Blanchimont corner. Cars are usually driving at speeds of around 297km/h in 6th gear at this part of the track. It follows on from the long, fast Curve Paul Frere and leads into a chicane. So smooth it almost seems like a straight, the drivers make this turn look very easy. Gold 6 and yet another general admission area have the best views of this section of the track. Gold 6 also has excellent views of the chicane that follows Blanchimont. There is a big TV screen directly opposite Gold 6, so the spectators can follow the rest of the race action. The Raidillon left hander is the exit of the thrilling Eau Rouge complex. 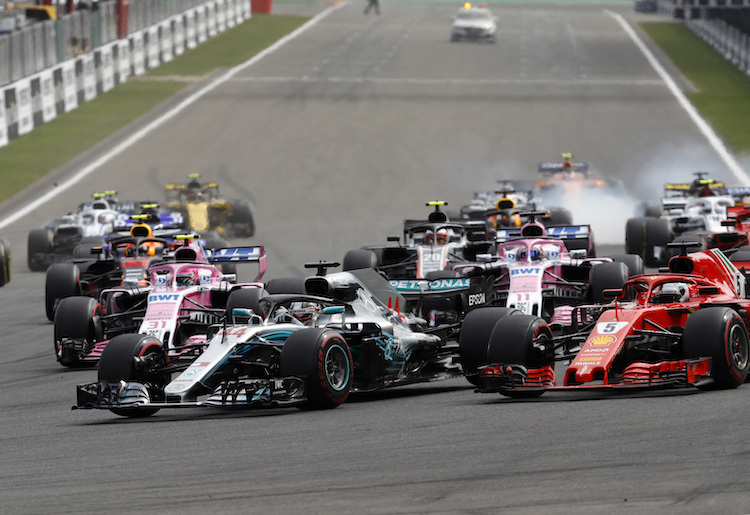 It is incredibly quick – cars will be reaching speeds of around 305km/h in 7th gear, preparing them for another full-throttle straight, the Kemmel straight. This is a good place to watch the race from if you want to see the cars going their absolute fastest, with also a good view of the Eau Rouge action. Gold 3 and also a large general admission area have the best views of this section of the track, with Gold 3 also enjoying a perfect view of Eau Rouge. There is a big TV screen visible from Gold 3 and there is also one opposite the general admission area. Pouhon is turn 10 of the Spa-Francorchamps circuit, following on from a short, steep downhill straight. A critical point in the circuit, this is a very quick downhill left-hander, tackled at speeds of around 290km/h in 5th gear. It is a fairly smooth corner but because it is taken at such high speeds, it can be difficult to find the right line. Because it is downhill, this can often be a very dangerous part of the track if water gathers here in heavy rain – very entertaining to watch of course! These general admission areas are a good place to see the action of Pouhon from, at great value for money. There are a few TV screens dotted around this area so that everybody has a chance to see what else is happening during the race. At the end of the super-fast Kemmel straight is the Les Combes right-hander. Cars will have to slow down considerably to take this corner at around 140km/h in 3rd gear. A left-hand corner quickly follows, leading into the Malmedy chicane. This little series of turns after such a fast straight requires precision, and can be an interesting place to be positioned for the race. Silver 3 has the best view of this series of turns, as well as good views of the following short straight into turn 8. There is also a big TV screen visible from this grandstand, to see what is happening during the rest of the race. Spectators watching from the general admission area at Kemmel straight will also have an okay view of Les Combes. Corner 8 is the Rivage hairpin, the second hairpin turn of the circuit. It follows on from a short straight so the cars do need to slow down considerably for this one. At this tricky downhill right-hander cars will be braking hard down to speeds of around 110km/h and will probably use second gear. This hairpin occasionally sees some good overtaking opportunities and is a favourite spot for photographers. Silver 3 has partial views of Rivage, but it can also be seen from the general admission area between turns 9 and 10. Curve Paul Frere marks the beginning of the third and final sector of the circuit. It follows on from a fairly tight right-handed turn 14, and leads into another straight which can be taken flat out. It is a very long, smooth corner and is taken very quickly, at speeds of around 314km/h in 7th gear. There is a large gravel run-off area just at the entrance to this corner, which can make for interesting viewing if any drivers go wide. The large general admission area right on turn 14 has an excellent view of Curve Paul Frere. There is again a TV screen for the benefit of those spectators watching from this general admission area. The Malmedy corner follows on from Les Combes and the Malmedy chicane. It leads up to yet another fast straight, so the cars will be speeding up to around 177km/h in 3rd gear at this point of the circuit. This right-hander makes up turn 7 of the circuit. Silver 3 has a great view of Malmedy corner, as well as the Les Combes right-left flick and all the way down to the entrance to the Rivage hairpin. Again, there is a big TV screen opposite this grandstand. The fairly long Fagnes corner is turn 13 of the circuit. Although a pretty smooth left-hand turn, it is only taken at speeds of around 170km/h in 3rd gear, because the cars have just come out of the much sharper and a bit slower turn 12. Fagnes is right at the end of sector 2 of the circuit and leads straight into turn 14.The general admission area between turns 11 and 13 is a good place to see the cars take on Fagnes corner. It offers great value for money and TV screens are also visible from this area. 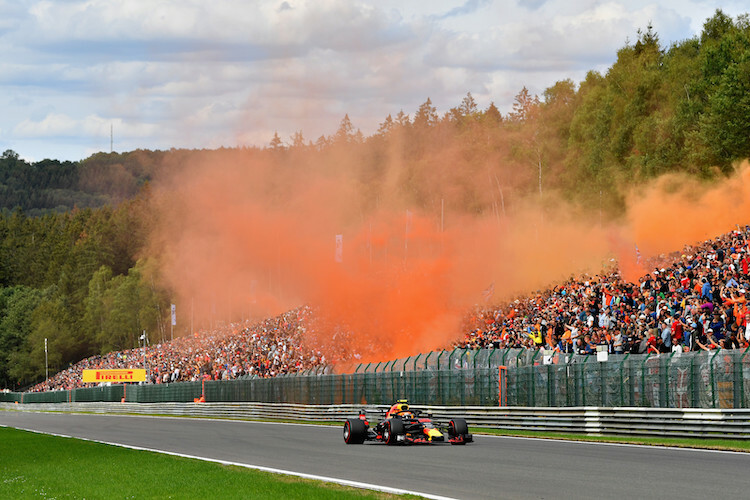 General admission tickets are great value for money, particularly at the Belgian Grand Prix. Spa-Francorchamps offers many places around the circuit that you can access with a general admission ticket. Not the conventional seated grandstands, these areas include high and steep banked hillsides and wooded areas around the track. The best general admission area at Spa is that between turns 11 and 12, right up on the hill side looking down onto Pouhon. Hundreds of fans congregate here making for a great atmosphere and view. It might also be an idea to bring fold away chairs and binoculars for some parts of general admission.